Our report this month ranges from the snow covered valleys of British Columbia to the sunny mountains of Mexico, with news, programs, and great deals at dude and guest ranches everywhere in between. There’s still time for a late winter getaway, and it’s not too soon to start planning for a summer vacation. “Tod Mountain Ranch is the perfect relaxing winter getaway,” enthuses owner Tracey O’Connell. Situated in the quiet beauty of Louis Creek Valley, it offers peace and tranquility backed by stunning views. The lodge has a large but cozy living area with fireside lounge, TV lounge, recreation room and a dining room where they serve hearty, home-cooked meals. Accommodation in cabins provides a hint of luxury at the end of the day. 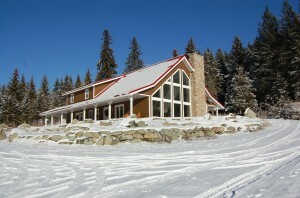 Take advantage of close proximity to Sun Peaks Ski Resort and vacation at Tod Mountain Ranch. Located only 15 minutes’ drive from the ski resort, a stay at the ranch means you can enjoy all the activities of Sun Peaks during the day, then relax in comfort at the ranch in the evening. Details: All-inclusive rate of $110 per person per night includes accommodation, 3 meals daily and use of all ranch facilities. Package available from Feb. 1—Mar 31, 2010. Giddyup, amigo. Yep, you can combine a sunny, south-of-the-border getaway with traditional dude ranch fun and horseback riding. 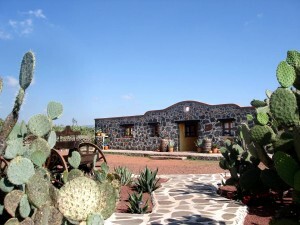 The authentic Mexican cuisine and massage/spa treatments are nice twists on the usual ranch vacation theme. Located just 90 minutes from the Mexico City International Airport and tucked in the mountains overlooking waterfalls, Rancho Las Cascadas is something special. This month, they have some special offers coming up. From Shell, Wyoming, Natalie Longwell is calling me in the middle of a snowstorm. “It’s snowing right now,” she says, “which is good because we’ve got a bunch of photographers here doing a photo shoot.” It’s part of a ‘winter photo safari’ trip, she explains. It’s not surprising that The Hideout Guest Ranch & Resort is popular with photographers: it’s right by the scenic Big Horn Mountains and home to ton of wildlife (including one of America’s largest wintering bighorn sheep herds). “We’re looking forward to a busy spring and summer,” says Natalie. But before that, a host of special programs kick off. First comes the Natural Horsemanship Clinic “A new program, focuses on our fantastic horse trainers. Natural horsemanship is a quieter, more gentle approach rather than the old cowboy way of breaking the horse. You end up with calmer animals and better communication from the rider.” Then Branding Week. “Guests can ride in the spring roundup and help with the branding. It takes them back to a piece of the old West. It’s a lot of fun and they really help.” A typcial day starts with round up where all the cow/calf pairs are brought into pens and sorted. After a wonderful picnic lunch (or barbecue lunch), the roping and branding commences throughout the afternoon. Space is limited,so book soon. All the wet weather California has had this winter promises a fabulous rafting season this spring and summer. And there’s one dude ranch poised to take advantage of the news. Tucked into the forest at Somes Bar, California (north of Redding), Marble Mountain Guest Ranch offers mountain trails, great fishing streams, a range for sporting clays, and upscale cuisine. But whitewater rafting on the nearby Klamath River is one of their passions. With warm flows in the summer, great swimming, and beginner to intermediate level rapids (class II and III), the Klamath is perfect for the whole family. “The Klamath flows fairly steadily all summer long,” says Cole. Marble Mountain Guest Ranch schedules whitewater rafting and kayaking during the warmer afternoon hours (smart!) and they hit a different stretch of the river each day; shuttles take no more than 35 minutes to the launch site on any day. Talk about a cool summer escape. Outside Mosca, Colorado, hard by the Great Sand Dunes National Park, sits the storied Zapata Ranch. Visitors here find a unique ranch experience. The ranch is owned by the Nature Conservancy, and managed by a third-generation ranch family (the Duke and Janet Phillips Family) with a unusual mission: to create a working ranching as an ecological resource base, supporting a mix of activities and always emphasizing sustainability, innovative management, and diversification. But it’s not a ‘pretend’ ranch; they work hard to maintain both economic and ecological viability. They believe that ranchers provide an increasingly important role in the stewardship of our nation’s native rangelands. Oh, and did we mention that they run bison as well as cattle on this 103,000-acre spread? Here in the high desert grasslands, the bison are managed as a ‘conservation herd’, meaning that they run as a wild herd. The Zapata Ranch does no branding, feeding, or weaning. Bison are gathered once a year (in November) and get sorted out to be sold for meat, tagged, vaccinated for bruccelosis, or sold to another rancher. And yes, you can buy Zapata Ranch grass fed/finished bison meat. Nature is more than just a backdrop. The ranch borders the Great Sand Dunes National Park and Preserve, the newest National Park in America. The ecosystem includes alpine forests, creeks and wetlands, grasslands, sand dunes, and lush meadows. The ranch and surrounding San Luis Valley of Southern Colorado is a wildlife mecca where you’ll find bison, coyote, deer, elk, and birds of many species (including thousands of migrating sandhill cranes). Details: Vacations here revolve around learning through experience, as guests learn about real ranch life and about the great outdoors. You’ll choose from three primary programs: horsemanship experience, ranch experience, or nature experience.